On an abnormal Andalucia weather day a couple of weekends ago hubby and I set off on a wild, windy, grey trip to Villanueva del Rosario in the north of Malaga province. 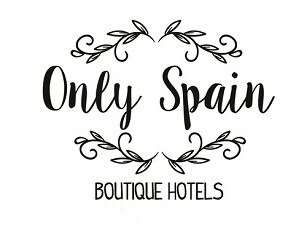 We were visiting another lovely hotel for our growing portfolio Only Spain ~ Boutique Hotels. We love driving and exploring Spain so our first dilema was which route to take. We don't do the easiest, most direct or quickest, neither do we go loads of kilometres out of our way. So our chosen route was through the two lovely towns of Priego de Cordoba where we stopped for lunch then Iznajar with it's castle-topped town and reservoir. Priego de Cordoba has a huge, long balcony, better, I think, than Ronda's and some wonderful arhcitecture, well worth a visit or more. We were running late (as usual) so we dumped our planned lunch venue for a smaller spot nearer the parked car. Then we took a long, lovely, windy road (one of those that I have to take over driving or turn green) to Iznajar past the lovely, rustic B&B Finca Las Encinas where we stayed and did a cooking class a few years ago and crossed over the aquamarine waters of the reservoir at Iznajar into Malaga province. As we approached Villanueva del Rosario the skies darkened and I knew the cameras wouldn't be in use outdoors that day. But they certainly were inside. Our destination was Cortijo Sabila a gorgeous, small, owner-run hotel - just the type I love promoting via Only Spain. With 10 bedrooms this lovely and antique-filled Cortijo (country house) and family home is a real treat and retreat. It is only about 35 minutes drive from Malaga airport but centuries apart with the relaxing views and laid back loveliness. While the wind howled outside we snapped lots of photos, enjoyed the comfortable large living room with a blazing fire and dined in fine style from the home cooked menu and plentiful wine. Cortijo Sabila is gorgeous, even though the weather wasn't and I could imagine those long, lazy summer days helping myself at the pool honesty bar, reclining on a sunbed, breathing in the fresh air and far reaching views. I definitely want to go back in summer! The gardens and different sitting areas including an English-style fish pond and fountains like in the Alhambra Palace. Lots of care, attention and love have gone into making this a warm, homely and want-to-return small hotel. See Cortijo Sabila on Only Spain with hotel photos in sunshine! !